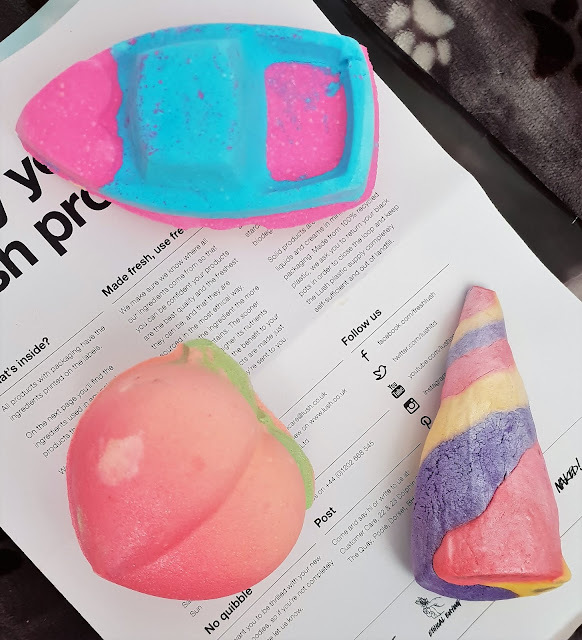 If you've been following this blog for some time, you'll no doubt know by now that I am a huge Lush fan. Truth be told, though, I wasn't always like this. I used to loathe Lush; thinking it was just for fans of soaking in the bath. Something I was not a fan of just a few years ago. And the smell every time I passed the shop always put me off; it was so overpowering! But then I decided to jump on the Lush bandwagon because, well, every other blogger seemed to love Lush. I felt like I should give it a chance too. And 'lo, my obsession with all things Lush was started. Now my bathroom has been taken over by 20+ bath bombs, 10+ bubble bars and 5+ shower gels; all just waiting for me to get through them. And every time Lush release a new collection, for Valentine's Day/Mother's Day/Christmas/etc, you'd better believe I'm on their website that same day buying it all! Lush recently released their Valentine's Day collection, and obviously I was all over it. The collection includes a returning favourite of mine, and many others, in the form of the Unicorn Horn Bubble Bar. I still prefer the original Unicorn Horn which was so much brighter and vibrant. But this year's edition is still so pretty, smells amazing, and appeals to all unicorn fans. I'm sure! Taking the risque approach, Lush have also released a range of products relating to some saucy emojis. There's the Peachy Bath Bomb, the Aubergine Bath Bomb, and The Big Banana Massage Bear. Saucy! The Aubergine Bath Bomb didn't appeal to me, but the Peachy Bath Bomb certainly did. It looks fab, is bound to create a nice colour in the bath when I finally get around to using it, and smells divine. I also picked up a returning favourite, one that was certainly part of last year's Valentine's Day collection. The Love Boat Bath Bomb is one of the best bath bombs, as it bobs around fizzing away in the bath, looking every bit like a real boat as it does! Plus, it leaves the bath water a gorgeous deep purple colour. My favourite colour! American Cream is a gorgeous baby pink colour, and smells strongly of strawberries and vanilla. It's a very relaxing, gentle scent. Not too overpowering, but definitely there. And a lovely consistency as it foams up. Strawberry milkshake...that's what this shower gel reminds me of. And that's no bad thing. American Cream would be the perfect shower gel for summer months! Avocado Wash combines organic Avocado and Avocado oil to create a softening and conditioning shower gel. 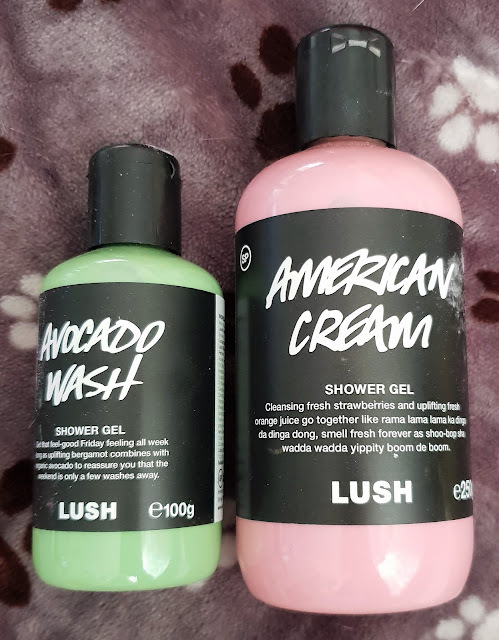 It should be pretty obvious that this shower gel smells strongly of Avocado, and although I'm not a huge fan of Avocados (how am I even a millennial, right?! ), I really like the smell. I don't think I'd like too much of it though, so I'm glad I stuck to just a small bottle for this one. There are so many other products in the Lush Valentine's Day range. Like both American Cream and Avocado Wash in Naked form. Strawberry Whip Soap and Love Island Body Scrub. Six Reusable Bubble Bar and Eve's Cherry Lip Scrub. American Pie Body Conditioner and Adam's Apple Mouthwash Tabs. There's surely something to suit everyone. I'm sure their Valentine's Day range is bigger this year than in previous years. And it's got me even more excited for their other, upcoming collections; Mother's Day, Father's Day etc. Shop the Lush Valentine's Day collection here.